At 11:39 p.m. , Wednesday, – well past my bedtime – Braves rookie first baseman Freddie Freeman grounded into a double play, ending the Braves season. As I struggled to stay awake during the final two hours of the 13-inning marathon game, I couldn’t help but think of my grandfather as I watched the drama unfold. The voices of the Atlanta Braves circa 1977. From left, Skip Caray, Ernie Johnson and Pete Van Wieren. Paw Paw was the kind of Braves fan that followed their occasional ups but mostly downs with a chuckle and pitying head shake. 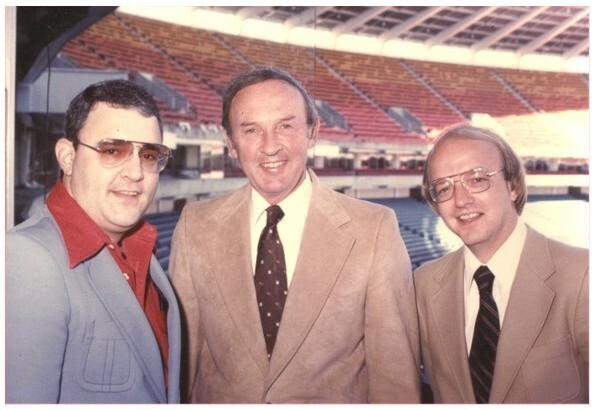 Paw Paw was a SuperStation fan, letting the voices of the late Ernie Johnson, the late Skip Caray and Pete Van Wieren form the background noise of summer. Watching ballgames with Paw Paw was less about baseball for me and more about being with him. He didn’t try to explain the action or teach me any of the intricacies of a sport that still baffles me most of the time. He simply uttered little expressions of disbelief or humor as the Braves’ antics unfolded on the field. 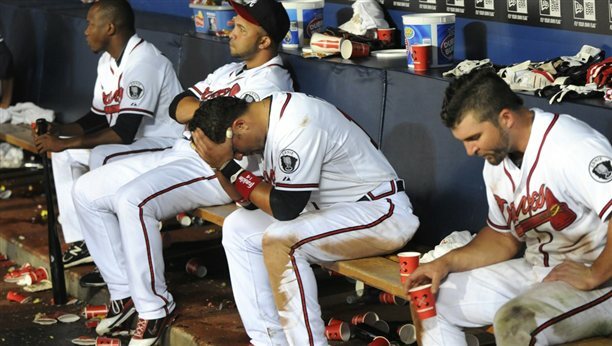 The scene from the dugout after Wednesday night's loss to the Phillies. While the 2011 edition of the Braves were losing a game they should have won to end a season that should have ended in a trip to the playoffs, I thought about the summer I became a Braves fan. The magical 1982 season began with a record-setting 13-game winning streak. Manager Joe Torre made all the right moves that season with an MVP year from Murphy, 17 wins from knuckleballer Neikro and the amazing double-play combo of Glenn Hubbard at second base and Rafael Ramirez at shortstop. That also happened to be the summer we moved from Texas to Florida, and during the transition, my brother, Lee, and I spent two weeks in Columbus, watching the Braves every night with Paw Paw. We went to our first Braves game on Aug. 20, 1982, with Paw Paw’s church. My Aunt Phyllis took us to see the Braves play the Mets, a game that was supposed to have been pitched by Neikro but ended up in the hands of Pascual Perez who missed his start the previous night because he got lost on I-285 on his way to the ballpark. The Braves won, and I was hooked. Florida had no major league team at the time, so as we settled in Lake Wales, we adopted the Braves who were conveniently on television every night, thanks to WTBS. For me, it was as simple as liking the Braves because Paw Paw liked them. Paw Paw died in the winter of 1992. He lived to see the Braves play in a World Series, completing a worst-to-first turnaround from the 1990 to 1991 season. He didn’t get to see their lone World Series championship in 1995. I’m sure, though, that he wouldn’t have gotten too worked up during the Braves’ 15-year playoff run nor too discouraged when all but one of those seasons ended with a loss. As they failed to reach the postseason Wednesday night after blowing an 8-and-a-half game lead in September, I frowned, shook my head, let out a soft “shewwwwwwt” and went to bed. Thank you, Braves, for another interesting season and another chance to remember my Paw Paw. This entry was posted in Uncategorized and tagged Atlanta Braves, baseball, collapse, Dale Murphy, Ernie Johnson, Glenn Hubbard, Joe Torre, Lance Elliott Wallace, Lance Wallace, New South, New South Essays, NewSouth, Pascual Perez, paw paw, Pete Van Wieren, Phil Neikro, Philadelphia Phillies, playoffs, Rafael Ramirez, Skip Caray, Southern Culture, Southern Living, Southern sports, Superstation, the South, WTBS. Bookmark the permalink. Funny how men & women have opposite memories. My grandfather loved the Braves (and sports in general) as well, which meant that he watched SportsCenter every Saturday morning. When we would visit we watched the loop over and over from 7am until noon. Not so fun when you’re a little girl just wanting to watch cartoons.